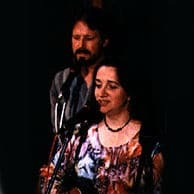 2002 Juno nominee Eileen McGann is widely acclaimed as one of the best contemporary Canadian songwriters, as well as one of the finest Celtic traditional singers anywhere. Add to this a dynamic performance style, an infectious sense of humour and a singing voice variously described as “magnificent”, “stunning” and “hauntingly beautiful”, and you have an artist not to be missed. Her songs paint pictures, tell stories and poke fun at life’s absurdities. A strong environmental and social sensibility pervades much of her writing and her choice of traditional material ranges from ancient ballads to rollicking songs of love and adventure. Soaring vocals, insightful lyrics and a powerful ability to make both her own and traditional songs come alive for audiences: these qualities have made Eileen McGann a mainstay at festivals across Canada, the US and Great Britain for almost two decades. Eileen will be performing with acclaimed multi-instrumentalist sideman David K, on Irish bouzouki, bass, National tri-cone and harmony vocals. Eileen has released six solo recordings, all of which have received international five-star reviews. Her 2002 CD Beyond The Storm is a stunning collection of songs old and very new, and was nominated for a Juno for “Best Album: Roots & Traditional.” Many of Eileen’s songs are regularly sung at The Old Chestnuts. From Ontario, now living in British Columbia, this show marks Eileen’s third appearance at Folk Night, and the first with David K, for the 8th Merrick Jarrett Concert; Merrick was a big fan of Eileen’s and you will be too! Tickets are $18 in advance, $20 at the door. Show starts at 8 pm.